I’m sure that many of you, like me, are on an eternal quest for organization. I know I’m not alone in finding the Container Store’s promise of a perfect, organized life utterly seductive. But here’s the thing…I don’t really like purging, I love my stuff. Therefore I also love pretty things in which to stash my stuff, so I get to enjoy my fantasy of being organized and contained. This tutorial is about helping you stay organized, in a quick, easy, and super-cute way. It is a distilled version of the Holland Cox pocketbook, and is a breeze to make. 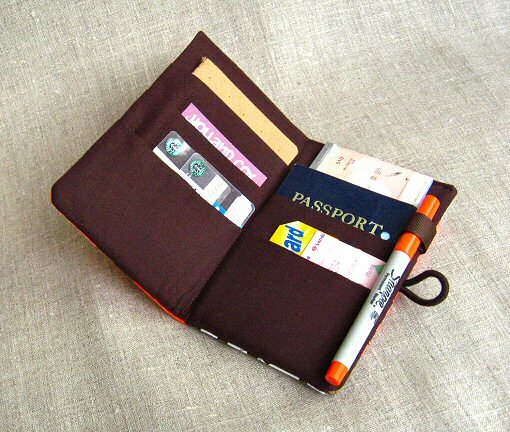 It’s got six pockets, a loop for a pen, and a very simple but expandable closure. A perfect project for a beginning sewer who doesn’t need any more pillows or placemats! Let’s get started. …is only four rectangles. I recommend measuring out your rectangles onto spare paper or poster board. All four are 9.25″ wide. the body is 7.25″ tall. 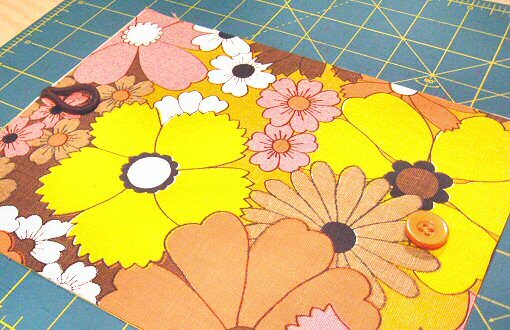 I chose a vintage cotton canvas for the body in a bright retro floral, and quilting weight cotton in a matching color for the interior. 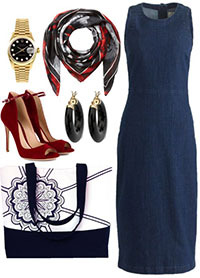 Denim, duck cloth, corduroy, or heavy weight upholstery fabric would also be appropriate for the body. You’ll also need a button and a bit of elastic for the closure, and a bit of ribbon for the pen. 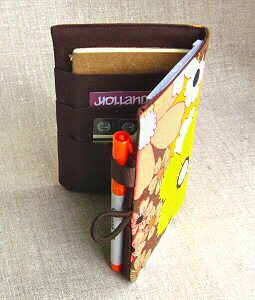 You could probably use elastic for the pen loop too, or even a strip of fabric. I used two layers of mid-weight interfacing on the body to give it some heft. 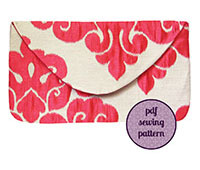 I like to use Pellon brand craft-fuse, a non-woven fusible interfacing. A half yard of quilting cotton will be more than enough for your interior pockets. You’ll be cutting the body in a single layer and the pockets on the fold. 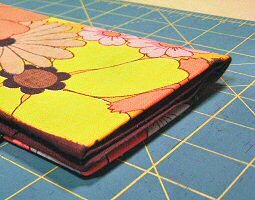 Fold your lining fabric so that the raw, cut edges are matching, and place the long sides of your pocket pattern pieces along the fold. The first step is ironing your fabrics. Following the manufacturer’s instructions, apply the interfacing to the wrong side of your outer fabric. Let it cool slightly before applying the second layer. Iron your pockets so that they each have a nice crease along the top, and they are all the same width. 1. 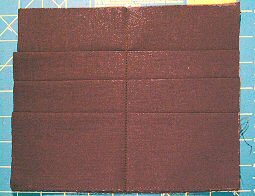 Line up your pockets by size, with the largest on the bottom and the smallest on top, and baste them onto the body lining along the bottom. 2. Sew a line down the center to divide your three pockets into six. 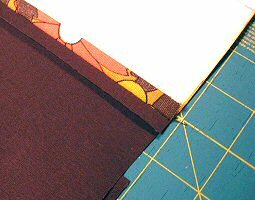 To find the exact center, fold in half and iron a crease, and then sew along the crease. 3. Using a ruler, sewing gauge, or tape measure, find and mark the center point on both short ends of the outside body. On the right hand side, mark a spot about 1 and 1/8th of an inch in. That’s where you’ll sew on your button (by hand). 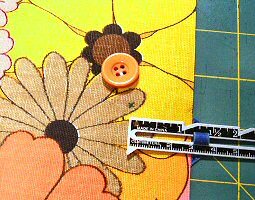 My button is 5/8″ wide, but you could use any size bigger than 1/2″. 4. 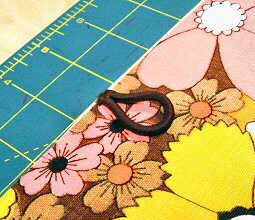 On the left hand side, use your sewing machine to baste the elastic loop in place at the spot you marked. I used an elastic hair tie, which I snipped down to 3.5″ and folded into a loop. 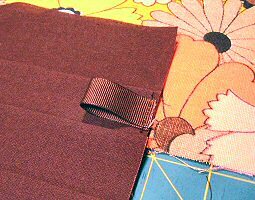 It’s very important that the button and elastic tie are lined up exactly, otherwise closing your mini pocketbook is going to be a challenge! 5. 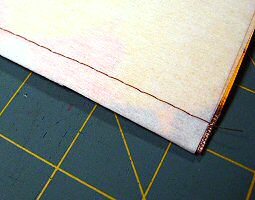 Cut a 2.5″ length of ribbon for the pen loop. I used 5/8″ wide grosgrain ribbon, but you could use any kind of ribbon, another length of elastic, a strip of fabric, or anything, really. Use a longer length (or something stretchy) if you plan on using an unusually large pen or marker. Baste it in place along the edge of the large pocket, just to keep it out of the way of the button loop. 6. 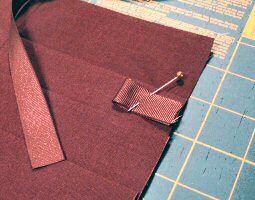 Placing the body and the lining with right sides facing, baste them together along the top with the longest basting stitch on your machine, using a 3/8″ seam allowance. 7. Then, press the seam allowance open. When you rip out the basting stitches, you’ll have perfectly pressed edge on both the body and the lining that are straight and even. Hooray! 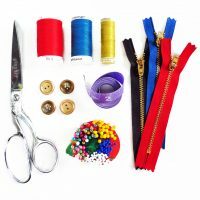 Now you are ready to sew both pieces together! 8. 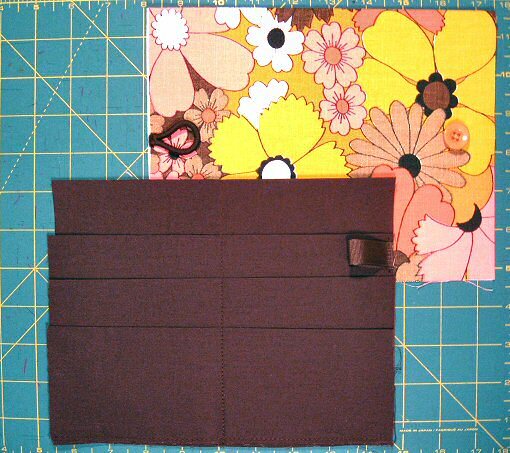 With right sides facing, and the folded edges matching, sew the body to the lining using a 3/8″ seam allowance, on three sides only. Leave the top, folded edge open. I like to double sew all of my seams, and reinforce the stress points of the elastic and ribbon loops. 9. 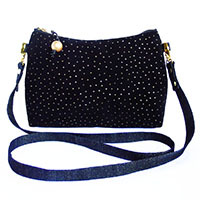 Clip the corners at an angle, and turn your mini pocketbook right side out. Use your fingers to press open the seams, and a dull pencil to gently push the corners out much as you can, and then iron your pocketbook flat. Make sure you keep the top folded edges matching while you’re pressing. Fold your pocketbook closed and iron along the spine, as well. 10. 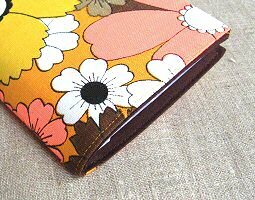 Topstitch along the top edge to close up and finish your pocketbook. If you wanted to insert lightweight cardboard, plastic canvas, or timtex (the stuff the goes in the bill of baseball hats), you’d do that at this step, before the topstitching. But I found that the double layer of craft fuse gives it plenty of stiffness. Finito! 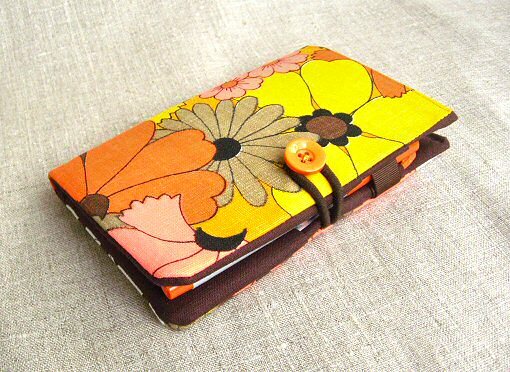 Your finished pocket book is approximately 4″ wide and 6.5″ tall when closed. 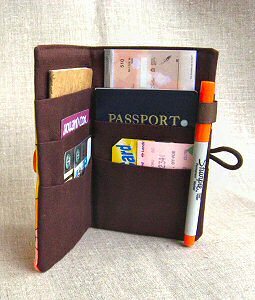 That makes the largest pockets the perfect size for a checkbook or a small Moleskine, the medium pockets Passport sized, and the small pockets ideal for credit cards, business cards, ID cards, and the like. You could easily add or remove a pocket, if you were so inclined. 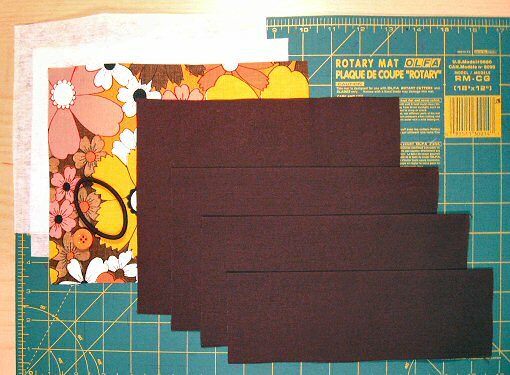 Also, since these pattern pieces are fairly small, this is an ideal project to use up scraps, especially if you’re not fussed about all the pieces matching exactly. If you make one, I’d love to see a picture! If you liked this tutorial, you’ll like the Syndicate newsletter even more. New tutorials, sewing patterns, and sewing tips & tricks every month! Click here to subscribe. If you found this tutorial useful, please use the links below to share with your friends, and of course comment to let me know what you think, ask questions, or to make any suggestions! I just made a very similar “book” that fits a 5 x 8 pad. I have it all finished and was closing the elastic loop and it pulled out of the seam. Is there any other way to fasten it, I stitched over in several times as you did. 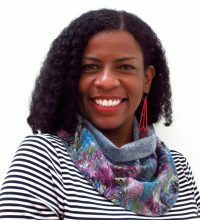 I got around this problem by using hair bobbles – the elastic ones that are sold in thrift shops by the card (I bought one with 20 bobbles, nearly run out now). This way, you have a flat ‘loop’ behind your stitches, so nothing pulls out. Thank you. Love your enthusiasm and simple instructions. Going on a big trip next year and will try this project. This was a great idea and seems super easy! Good directions and tips!!! Thank you!!! Thanks so much for the tip for the pen holder. I have made wallets before and this has been a problem to place the holder where it does not affect the construction of the rest of the wallet. I just made four of these. The problem is they all open on the wrong side. I should have noticed that the pen holder and the elastic should be on the same side. Just a heads up so someone else doesn’t make my mistake. They are very cute and I enjoyed making them. Thank you. can print it out as I find it very hard trying to copy from my lap top.